Like I have said in previous posts, sometimes it is a really great idea to think "outside the box" when it comes to picking out baby shower gifts. You don't always have to get something that is newborn themed. Believe it or not, some moms prefer gifts that will help them later on down the road, rather than immediately. I remember getting stuffed animals, toys, and even clothes for toddlers at my baby shower. Those things I was not able to use right away but when my daughter was a bit older, she really enjoyed digging into the new collection of toys and clothes. So, when you are shopping for that "perfect" shower gift, don't forget to think about things that baby might enjoy after they have matured a little bit. The company that I am going to introduce to you today has a great mix of baby and toddler toys and gifts that will allow you to pick just the right item for that special baby. Cate and Levi is a company that is found in Toronto (not too far from where I live!) and was founded by Josh Title. Josh was on the verge of becoming a father himself and...well...here is the rest of his story! The Cate & Levi Collection is HANDMADE at my studio in Toronto, Canada. Together with my talented production team, I oversee every aspect of this collection. All the materials are sourced as close to home as possible. This process cuts down on shipping and reduces our carbon footprint. The choice of reclaimed wool reduces demand for new materials that require both water and oil for production. My goal is for these items to leave the softest possible pawprint on our planet. No two Cate & Levi products will ever be the same. Each one is made from reclaimed wool whose colors and textures are individually selected. Not only is this process environmentally responsible, but it ensures that each animal is truly a one of a kind creation never to be duplicated. Each item is as unique as the child who adopts it. It is important for me to set a good example for my child, to work in a highly creative and responsible fashion, and to produce long lasting items that can be today's plaything and tomorrow's keepsake. I am building a company my family can be proud of. Ten percent of my profits will be donated to funds that help children in need. The whole reason Joshua started Cate and Levi was due to the lack of responsibly made, one-of-a-kind and beautifully designed products for children. Boy do I agree!! It is still hard to find products like the ones you will discover at Cate and Levi! So, for this review I was sent a Bunny Change Purse. I chose the bunny for my daughter because it had pink on it. :) This Bunny is made out of reclaimed wool, which makes it super soft...perfect for the child who likes to cuddle anything that looks remotely like a stuffed animal! My daughter could not wait to get her hands on her new wallet! I actually had to hide it from her until I was ready to write my review. When I finally got it out for her, she was really excited (even though she wasn't sure what to do with it.)! I let her check it out and then informed her that it was for her pennies. Well, then we had to go find some pennies to put in it and it was officially her purse. As you can see from the picture above, she is really happy with this Bunny Change Purse. It is girly, fun and colorful...all perfect combinations. Now, if you have a boy, then there are also change purses for them too. 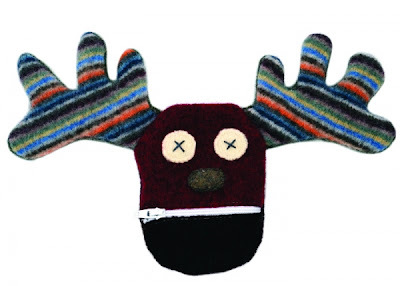 Check out the moose pictured above...isn't he darling? They also have other animals that will suit either a boy or a girl. All of Cate and Levi's change purses retail for $20. So, in my opinion...Cate and Levi is a pretty neat company that offers a nice variety of gift ideas. I love how their products are organic and actually safe for babies and toddlers (which is a hard combination to find these days). I would definitely recommend this company to moms and dads who are looking for a great source for gifts for either their own children, or for someone else's. Disclaimer: I received no monetary compensation for this post. I did receive a free Cate and Levi Change Purse for review purposes. All quotes and stock photos are from the Cate and Levi website and email. Prize is being provided and shipped by the sponsor. All thoughts and opinions are 100% mine. I would pick the bunny for my daughter. I'd pick the dog. Thanks for the chance. I would choose the moose! Thanks for the chance! I would choose the cow, thanks! I like the monkey one! I would pick the bunny! I like the bunny! Thanks!!! I think my son would like the dog the most! My favorite is the Monkey! Neat giveaway. Different. Thanks. I'd choose Dog. I love the monkey for my kids! I would choose the buuny for my daughter. I would choose the Monkey. I would choose the dog. Thank you for the chance to win! Floor Mats Will Save Your Car!